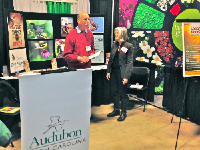 Local Roots, Audubon NC’s newest initiative to bring back native plants that specifically benefit birds and our local economy, was launched Jan. 8 and 9 at the Green and Growin’ Show with assistance from several members of our own T. Gilbert Pearson chapter. The Local Roots program targets the entire green industry from growers to landscapers, retailers, and gardeners, with the goal of getting a commitment from growers and retailers to grow and sell a select list of native plants each year for the next three years, beginning in 2015. In return for this commitment, Audubon NC provides marketing and education to promote the Bird-Friendly Native Plants of the Year collection. Using a “collect as you grow” model of marketing, Audubon NC will emphasize the current year’s list of new plants while continuing to market the full list of native plant options. Growers and nurseries that signed on with Local Roots will receive digital tools to help market native plants on their website or social media, including photos of birds and native plants and fast facts. Contact information for Local Roots growers will be included on a flyer sent to Local Roots retailers, and growers will receive a list of Local Roots retailers. Retailers will receive plant markers to label plants as bird-friendly natives. Audubon NC will also send periodic e-bulletins to growers, retailers, landscapers, and gardeners who want information about our Bird-Friendly Native Plants of the Year and updates on the program. Eleven of the 13 people who staffed the Audubon NC exhibit at Green and Growin’ were TGPAS volunteers. Thanks to Dennis Burnette, Marie Dow, Barbara Hughes, Jack Jezorek, Margaret Kane, Howard Millican, Lynn Moseley, Deborah Staves, Ann Walter-Fromson, and Peggy Young for their help getting Local Roots launched. Kim Brand, the Bird-Friendly Communities Coordinator for Audubon NC, guided our efforts from set-up time on Wednesday until closing on Friday afternoon; Lena Gallitano from Wake Audubon, who is an Audubon NC board member, volunteered on Thursday afternoon and Friday. We were successful in getting 16 growers, retailers, and landscapers signed up to participate in the Local Roots program, and a total of 73 people signed up to subscribe to Local Roots e-news. That’s a great start! We found that nearly all the people we talked with were supportive, interested, or even excited about the the Local Roots program. Our focus now is to sign up more growers, retailers, and landscapers to participate in Local Roots; they can sign up online at Growers/retailers sign-up. 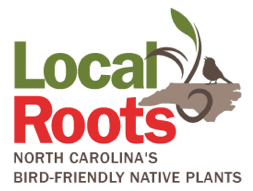 Gardeners who want to get the Local Roots e-bulletin can sign up online at Gardeners sign-up, and soon you will be able to find a list of retailers selling native plants on the Audubon NC website. Here’s the list of 2015 Bird-friendly Native Plants of the Year — which ones will you plant in your yard this year? Lake Townsend, our county’s largest reservoir, was the primary destination for our monthly Second Sunday Nature Walk on Jan. 11. A dozen of us showed up for some fun winter birding. We were hoping to see a good selection of waterfowl, and that’s exactly what we did! Before heading to Lake Townsend, we began with a stop to scan the waterfowl on Buffalo Lake from the dam just off Cone Boulevard. We saw lots of birds! Among the most entertaining were several close in rafts of Ruddy Ducks looking like tub toys with their plump bodies and cocked-up tails. There were lots of other “tub toys,” Buffleheads, further out. And many Canada Geese and Mallards, of course. We continued our birding on the Yanceyville Street causeway across Lake Townsend where we were able to scan the lake in both directions. We didn’t see anything really exotic, but it’s always nice to the beautiful Hooded Mergansers. Most of the ducks were on the east aide of the causeway, as well as big flocks of gulls. The majority of the gulls were Ring-billed, but among them were at least three adult and one juvenile Herring Gulls. We continued on up Yanceyville to check other lake overlooks nearby. We saw a couple of rafts of Gadwalls along the way. On Doggett Road, far in the distance to the north, we saw a large conglomeration of several species of ducks. We also checked the two overlooks on Church Street on the way back to our starting point where we saw ducks but didn’t add any new species. Driving along the road, however, some of us saw a Bald Eagle fly over. By the end of the afternoon we also had seen at least five Great Blue Herons. Our monthly Second Sunday Nature Walks are easy nature outings that are perfect for beginners, including older children with an adults. Our next one will be on February 8, a walk in Price Park for winter birds. We hope that you’ll join us! Let’s look for winter birds! Join us for our monthly Second Sunday Nature Walk on Feb. 8. It will be our first activity in a month with a lot of fun Audubon stuff going on. This month we’ll explore the City of Greensboro’s Price Park. Our chapter spends a lot of time in this beautiful place of woodlands, meadows, a creek and a lake. TGPAS works with the City Parks and Recreation Department to manage the Wet Meadow below the KCEF Branch Library, provided partial funding for a Chimney Swift nesting tower in the nearby Meadowlark Sanctuary, maintains a display in the kiosk in the Bird & Butterfly Meadow, and funded a series of interpretive signs along the woodland trail. We also present our monthly meetings in the library, participate in the Earth Day celebration outside the library, and conduct various workshops and classes in the park. See the articles elsewhere in this issue for upcoming activities that are sure to interest you. With such a wide variety of habitats in Price Park, you would be correct to expect lots of different critters and plants. In fact, we found more than 300 species when our chapter conducted a 14-hour inventory in May several years ago. Now we’re going to look for birds and others critters in February. Maybe we’ll even find some early signs of spring. As with most of our Second Sunday Nature Walks, we will meet first at 1:45 p.m. in the parking lot in front of the Whole Foods Market in Friendly Shopping Center. Look for us next to Friendly Avenue between Chick-fil-A and BB&T Bank. We intend to leave at 2 p.m. and expect to return to the parking lot by around 5 p.m. If you would like to meet us in the park instead, we’ll be in front of the library by about 2:20. 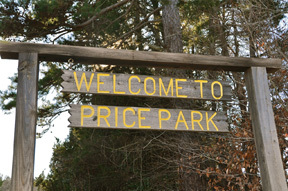 Price Park is located at the intersection of New Garden Road and Hobbs Road. Note that the entrance to the park has been moved to Hobbs Road. When: February 12, 2015; 6:45 p.m.
Chirp. Chirp. You hear the soft call of a bird on the ground. It’s a baby. You look up and see a nest. Should you return the baby bird to its nest? You have heard that the mother will reject a baby bird if touched by human hands. Is it true? Is the bird injured? If so, whom do you call? How do you transport it? Our featured speaker will be Melissa Coe, President of Piedmont Wildlife Rehab (PWR) a local cooperative of home-based licensed wildlife rehabilitators. Their mission: to help injured and orphaned wildlife through rehabilitation in order to release them back into a natural habitat. They are also committed to sharing the importance of environmental stewardship and encouraging a better understanding of our local wildlife through educational programs. Join us for a program to learn about the local wildlife PWR helps, get answers your questions, and maybe have a visit from a surprise animal or two. Photo at top of article: Baby Opossum. At left: Sora Rail. 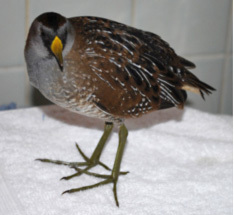 Photos courtesy of Piedmont Wildlife Rehab. Look forward to spring with a yard full of native flowering plants and we are here to help make that happen. Be sure to come to the Audubon meeting February 12th for a terrific program about wildlife rehabilitation and our wonderful give away. If you are tired of winter and just cannot wait for spring, we have just the surprise to make you get spring fever. 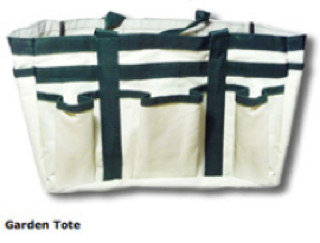 We will give away 15 Audubon garden totes as door prizes which are just fabulous for holding all of your gardening tools and supplies. Each tote will also contain packets of seeds from several varieties of native flowering plants. All of the seeds will be ready to plant, no pretreatment is necessary, either in a flat now for transplant later or directly in the ground after danger of frost. You can start dreaming of a yard with many flowers to attract birds, bees, and butterflies. Each of the varieties will be excellent sources of nectar and seed for many birds and butterflies. The seeds will include Beebalm, Purple Coneflower, Black-eyed Susan, several varieties of milkweed, and a few surprises. Bring your “green thumb” and see you there. Each year for four days, people all over the world count birds that they see in their yards, parks, and neighborhoods. The Great Backyard Bird Count is a project of National Audubon Society, the Cornell Lab of Ornithology, and Bird Studies Canada held on Presidents’ Day weekend (Feb. 13 -16, 2015). Data you provide by recording the birds you see helps scientists understand what’s happening with birds and helps in planning for bird conservation. Participating in the Great Backyard Bird Count is good for the birds and fun for you. Ann will focus on how to do the count, how to enter data at the GBBC website, and how to use the Merlin Bird ID phone app for identifying birds. If you have a smart phone, you can download the free Merlin app before the presentation — iPhone and Android versions are available from the GBBC website. We will practice identifying photos of common backyard birds; you can use a field guide if you don’t have a smart phone. You can participate in the GBBC on the following Saturday without attending this presentation, of course, but both will be fun! Counting in a group sounds like it would be fun, doesn’t it? It’s also a great way to learn more about birds from other birders. TGPAS member Ann Walter-Fromson will lead a group to participate in the GBBC on Saturday, February 14, at Price Park. We will start at 9:30 a.m. and go until around 11 a.m. The plan is for small groups to work together to tally birds and then create one bird list that will be submitted to the GBBC website for the group. This will be a perfect opportunity for beginning birders to team with more experienced folks for both learning and fun. We hope you’ll join us! Let’s Do a Beginning Birder Walk Again! We had our winter Beginning Birder Walk back at the beginning of January, but since it was drizzling all morning that day, we’re scheduling another one. The new date is Sunday, Feb 22, 1:30-3 p.m. Once again it will be at Price Park. We wanted to start off the year right with a fun, laid-back bird walk especially for beginners, although we know that more experienced folks will enjoy it, too. The emphasis will be on learning to identify birds using clues such as size, shape, markings, habitat, and behavior; and we’ll have fun doing it in a relaxed, no-pressure setting. We may make mistakes, but it won’t matter. We’ve called it a walk, but there won’t be much walking involved, actually. We’ll be in Price Park outside and around the KCEF Branch Library. We’ll walk slowly and practice building our identification skills by watching common birds. As the title implies, this outing is especially for people who still think of themselves as beginning birders. The knowledgeable birders in our group started at the beginning, and we will, too. We won’t even need binoculars! Birds can be identified without binoculars or field guides, but bring them if you have them. We’ll talk about how to use these tools, and we’ll try to answer any questions participants have. As always, supervised older children are welcome, but no pets, please. Contact the leader, Dennis Burnette, at deburnette@triad.rr.com if you have questions. It is almost time for our Brown-headed Nuthatches to build their nests. The Audubon NC goal of 10,000 boxes by 2015 reached more than 7,000. Thanks to all of you, TGPAS has 160 of these boxes. To get us ready for 2015 nesting, here is a check list for you. Is your box installed and cleaned out? These nuthatches scout and establish territories during the fall. Sometimes they use boxes as winter shelters. 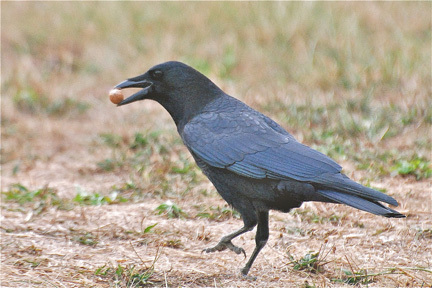 Nest building can begin as early as December and continue to late February. Expect egg laying from March to May. Monitoring nests will be needed until mid-June. Have you reported information to TGPAS? This is an important part of what you pledged when we gave you nest boxes or excluder plates. We want to know any and everything about your box (even “no activity” is information for us). Report to Stella Wear (stellaandtom2605@gmail.com). Have you registered with Audubon NC (sign up at audubonaction.org/NCNuthatches)? This keeps you up to date on the state project and gives you ideas on how to keep your birds safe and thriving. Register your boxes with Nestwatch. Last year several members reported frustrations with reporting data to Nestwatch. This year we want to use our group site for all data reporting. Here are brief instructions to get you started at http://nestwatch.org/ Sign in (located in upper right corner) using: username: TGPASociety; password: bhnuthatch. A page called “your data” comes up. Use the choice “add a new site.” Follow steps to locate and describe your box location. There are some drop down instructions that help. As an example, I entered the boxes at Southwest Park (SWPK001, SWPK002, SWPK003) and filled in the box description forms. After you save your entry, you are returned to “your data” page. Click on “nest site list” to see the boxes that have been registered. This is how you will get to your box to enter data when you have something to report. Please contact Stella Wear (stellaandtom2605@gmail.com) with any problems. A help session on data reporting is planned. Please let us know if you are interested. It is interesting to explore on NestWatch. There are some green tabs on the homepage that help you navigate through the site. For example, under the “learn” tab there are some “data entry tutorial videos” listed under “How to Nest Watch”. They are helpful for all steps of the process.